Wooroonooran National Park is huge. Wooroonooran National Park in north Queensland covers the whole area inland of Bruce Highway between Innisfail in south and Gordonvale in north, and contains Queensland’s highest mountain Bartle Frere. It is not as popular with travellers as is the Daintree National Park north of Cairns, but its rainforests are at least as good, with many rare rainforest plants and animals, some great camping, lakes, waterfalls and secret swimming holes. Here is some information about the park, and in the end of the page is a map of Wooroonooran national park. There are some classic rainforest animals in the park. Water animals include platypus and freshwater turtles. On the forest ground and in the trees are possums, rat-kangaroos and bandicoots. On the ground you can also see cassowaries and bush turkeys that build huge nests, and in the trees you can see fig parrots, fruit doves and spotted catbirds. Rainforest plants include tall trees that form the rainforest canopy, strangler figs, trees with buttress roots, rainforest ferns and fern trees, rainforest palms, vines and epiphytes that use different strategies to get up to the light. The forest ground is dark and not many plants can grow there. Beware that many rainforest plants are poisonous or stingy so do not taste them and try to not to even touch them. There are different sections in this national park. Palmerston section is the southernmost one, reached from the Palmerston Highway. Driving from Innisfail, there is first a short track that goes to North Johnstone River and Crawfords Lookout. Further inland along the highway is a short track to Tchupala Falls, and a longer bushwalk past Wallicher Falls, Goologans picnic area, Henrietta Creek Campground and Nandroya and Silver Creek Falls. At the Henrietta Creek there is also a campground. At Mamu Canopy Walkway, about 30km from Innisfail, you can watch the rainforest canopy and enjoy a nice view from the Canopy Tower. Further north is the Josephine Falls and Bartle Frere section of the park. There is a turnoff from Bruce Highway to Josephine Falls, where you have a short walking track to the falls and to a lookout. In the parking area there is a ranger station, picnic tables and toilets, but there is no camping area at the Josephine Falls. 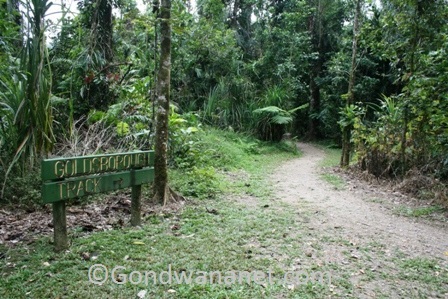 Here is also the start of the long bushwalk to the Mount Bartle Frere (1622m), the highest mountain in Queensland. You have to be fit and well prepared to do that walk, as it’s a steep climb and there are no facilities so you have to carry your food and water with you. There are camping grounds at Broken Nose, Eastern Summit, The Summit and the Junction. There are a few different options to do that walk, but it’s hard to fit it into one day. You can either walk until the Broken Nose and back, it’s 10km return (8hours). If you walk to the summit of the Bartle Frere, it’s 15km return and takes 2 days. Or, you can walk all the way from Josephine Falls to Atherton Tablelands on the other side, it’s 15km one way and takes two days. If you have someone to pick you up on the other side, you don’t have to walk the same way back again. 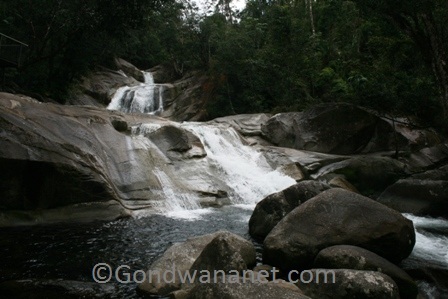 The third, northernmost section of the park is accessible from Babinda, where there is a turnoff to Babinda Boulders Road. Babinda Boulders is a beautiful rainforest waterhole, but take care as the rocks are slippery and people have been killed here. 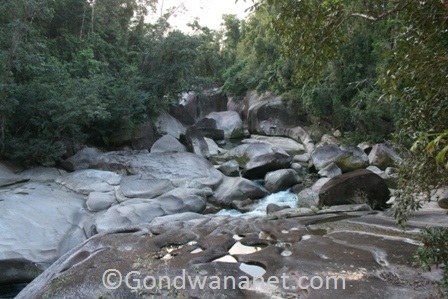 There is a picnic ground at the Babinda Boulders, but there is no camping here. Here is also the start of the long bushwalk called Goldfield Trail. 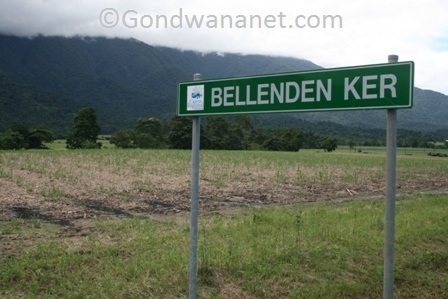 It is a historical trail made by gold prospectors in the 1930s, when gold was discovered on the Mount Bellender Ker Range. The walk goes to Goldsborough Valley and is 19km return. It is mostly flat, but gets a bit rough at times and there are also a few creek crossings. 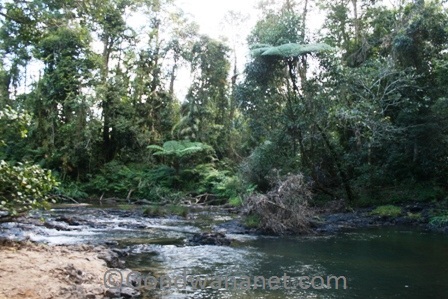 You can camp at the Goldsborough Valley, and also at Mulgrave River about half-way between Babinda and the end of the walk, where you can also do some fishing. The track between Goldsborough Valley and Mulgrave River is also accessible for mountain bikes, and again, if you don’t feel like walking the same way back, you can get someone to pick you up on the Atherton Tablelands. If you are visiting the Palmerston Section, you closest accommodation (other than camping in the national park) is in Millaa Millaa on the Atherton Tablelands or in Innisfail (Barrier Reef Motel, Moondarra Motel, Riverlodge Tropical Motel) on Bruce Highway. 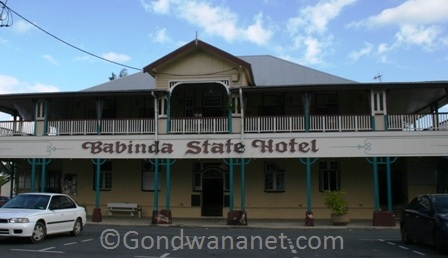 If you are visiting the northern sections, your closest accommodation will be in Babinda (hotel, camping ground), Mirriwinni (camping ground and caravan park at Bramston Beach), Fishery Falls (caravan park) or Gordonvale (hotels, caravan park) along the Bruce Highway. But of course, Cairns accommodation is not too far either. Here's a map of Wooroonooran National Park where I have tagged the places that I mentioned on this web page. You can click on the tags to see what places they are, and double-click anywhere on the map to zoom it in and see the places closer. Drag the map to move around, and if you want to see the satellite image with Google Earth, click on "Sat" in the top right hand corner.